Vanguard's Farm Powered Food Waste Recycling Program solves food waste challenges and sustains farms. Middlebury College, Goodrich Farm, Vermont Gas, and Vanguard Renewables Announce Farm Powered RNG partnership. Middlebury College will significantly reduce its carbon footprint thanks to an innovative partnership with Goodrich Family Farm in Salisbury, Vt., Vanguard Renewables of Wellesley, Mass., and Vermont Gas. Vanguard Renewables Farm Powered Anaerobic Digester will turn poop into power at Crescent Farm, Haverhill, Mass. Vanguard Renewables soon to be under construction Farm Powered Anaerobic Digester at Haverhill's Crescent Farm will turn cow manure from the 200 cows at the farm and recycled organic food waste into power. At Haverhill farm, it’s waste not, want not. Dairy Farmers of America (DFA), a national farmer-owned dairy cooperative, and Vanguard Renewables announce a strategic partnership to help bring anaerobic digestion technology to more farms across the country. 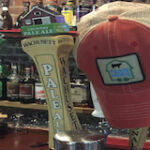 Wachusett Brewing Company of Westminster, Massachusetts is a Vanguard Renewables Farm Powered Partner. The brewing company purchases power from Vanguard's Jordan Dairy Farm anaerobic digester via net metering credits. Members and Friends of Cabot Creamery Cooperative Accept the 2016 U.S. Dairy Sustainability Award for Outstanding Dairy Processing and Manufacturing Sustainability on May 11 in Chicago, Ill.
"The nine honorees have truly integrated sustainability into their businesses to achieve not only economic success but also to support the well-being of their communities and our planet," said Barbara O'Brien, president of the Innovation Center. Polar Beverages is a sustainable energy leader in Massachusetts. Company initiatives include receiving energy credits from National Grid for the company's draw of "Farm Powered" energy from the anaerobic digester at Jordan Dairy Farm in Rutland, MA.